Looking for ten times the design options? 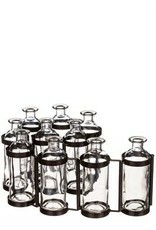 Well, you're in luck with this collection of glass bottle vases. Connected by hinged metal holders that are attached as a chain, but free to move about, each bottle is removable. Measuring 6.5" tall, this series of ten together totals 32.5" in length from end to end.